High Noon in the WARZONES! Your New Look at 1872 #1! This July, the frontier gets a bit more marvelous! Today, Marvel is pleased to present your new look at 1872 #1 – the debut issue from critically acclaimed writer Gerry Duggan (Deadpool, Hulk, Nova) and rising star artist Nik Virella (Return of the Living Deadpool)! Prepare to see the Marvel Universe like you’ve never seen before as fistfuls of action, drama and suspense await you on Battleworld! Welcome to the small frontier town of Timely. Among the grit and the gristle of everyday life, corruption runs rampant in this tiny settlement. Local Sheriff Steve Rogers is out to clean up his town – but casino owner Wilson Fisk has other ideas! But when a mysterious stranger comes to town from parts unknown, everything in Timely is about to change – for anyone left standing, that is! Who is this mysterious Red Wolf and what business does he have in Timely? 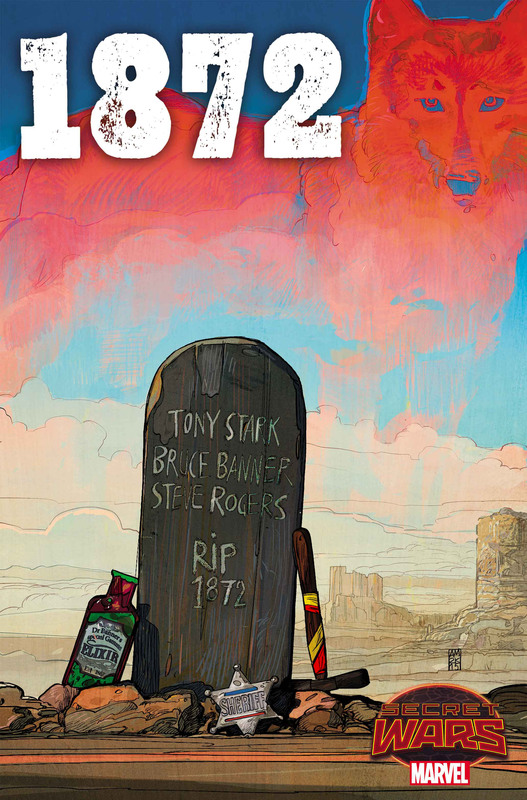 Find out this July, as 1872 #1 explodes into comic shops and on to digital devices. Saddle up, True Believer, it’s going to be a wild ride!